One talented creative team passes the torch to another! Haunt Immortal Edition Volume 2 delivers the final installment of Robert Kirkman and Greg Capullo’s critically acclaimed story arc, while paving the way for a new direction lead by the creative team of Joe Casey and Nathan Fox. Continue Daniel Kilgore’s unexpected foray into espionage with help from the ghost of his brother, Kurt. After getting the rug pulled out from under him, will Daniel be able to make sense of the nightmare he’s entered into? 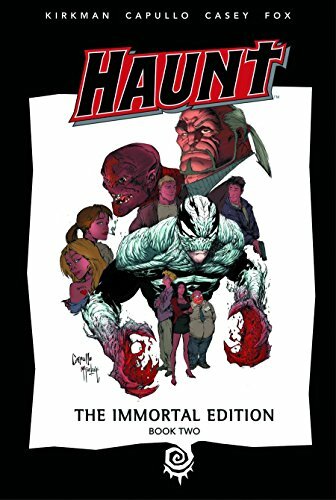 Haunt Immortal Edition Volume 2 HC includes bonus art from both creative teams, as well as a cover gallery, including alternate covers.